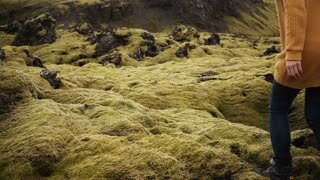 Aerial view of the beautiful landscape in Iceland, lava field covered moss. Two woman dance and jump on the mountain. Aerial view of the friends standing on the top of mountain and dancing of happiness. Two woman in lava field in Iceland. 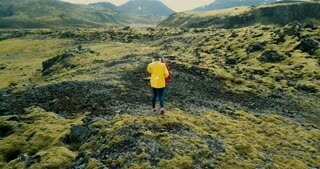 Aerial view of two woman walking on the lava field covered moss on Iceland. Tourists exploring the territory. Aerial view of two woman walking on the lava field in Iceland. Tourists female hiking on the mountains covered moss. Aerial view of the two happy woman standing on the rock and having fun, dancing. Lava field in Iceland covered moss. Two happy woman sitting on the lava field covered moss in Iceland and talking. Tourists friends resting after hiking. Back view of two tourists woman hiking together in Iceland. Girls walking through the lava field covered moss. 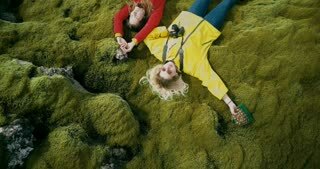 Aerial top view of the two happy woman lying on the soft moss in lava field in Iceland. Tourists resting on nature. Freedom: two tourists woman raises hands on the lava field covered moss in Iceland. Friends feeling happy after hiking. 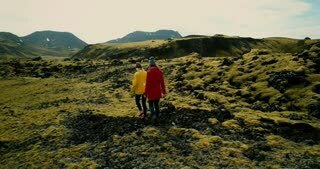 Two tourists woman walking through the lava field in Iceland covered moss. Girls raises hands, feels happy and freedom. Aerial view of two woman walking on the lava field in Iceland. Tourists exploring the meadow covered moss, hiking. Aerial view of two female walking on lava field covered moss in Iceland, exploring the meadow. Tourists hiking together.